1. Preheat oven to 400°. 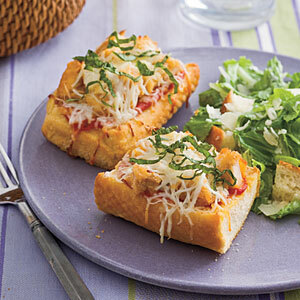 Arrange garlic bread, buttered sides up, on a baking sheet. 2. Bake at 400° for 8 to 9 minutes or until bread is lightly browned. Spread pizza sauce over garlic bread. 3. Cut chicken strips into 1/2-inch pieces, and arrange over pizza sauce. Sprinkle with cheese and basil. 4. Bake at 400° for 8 to 10 minutes or until cheese melts. Serve immediately.